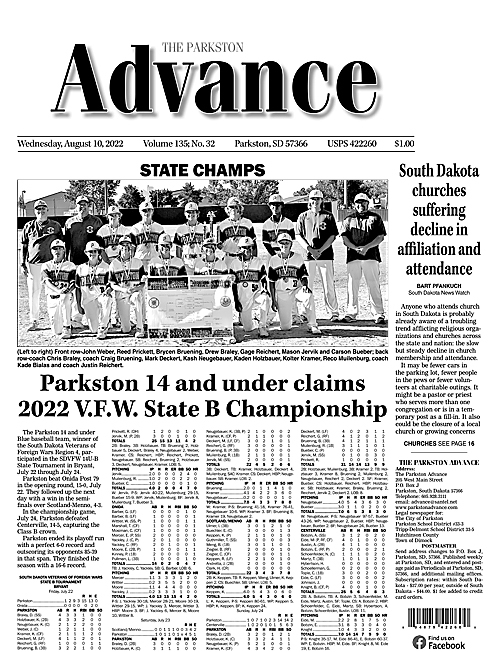 Welcome to The Parkston Advance, Inc.
Alcoholics Anonymous and Al-Anon will meet Friday at 8 p.m. at the Avera St. Benedict Health Center Meeting Room. For more information, call 928-3182. 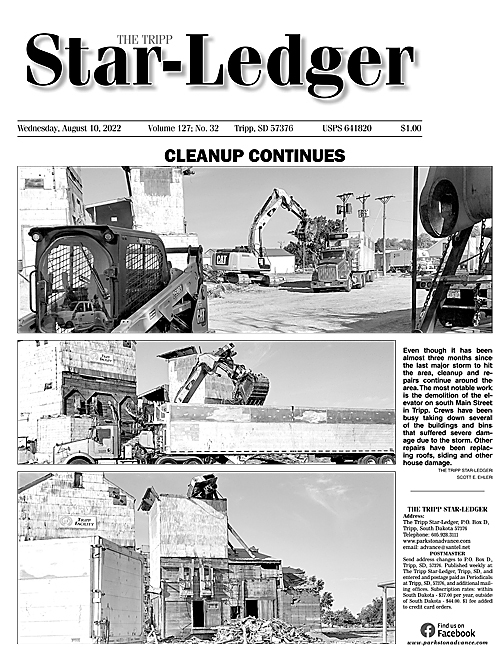 The Parkston Commercial Club will meet at Boog’s at 12 noon. Alcoholics Anonymous will meet Sunday at 7 p.m. at the Ethan Methodist Church basement. For more information, contact Jean at 928-7266 or Joe at 227-4303. In what was the biggest snowfall of the season, a tate spring storm dropped a whole lot of precipitation in the area. Two student organizations recently returned from their respective state conventions with many honors. The Parkston Elementary Student Council sponsored a Final Four Food Drive April 1 to April 5. The Kaylor 4-H club met April 6 at the Scotland Bowling Alley, with K. Schnabel, Bueber, and Herrboldt as the host families. Southeast Community College in Nebraska has released its Dean's List for the quarter recently completed on the Beatrice, Lincoln and Milford campuses. The Mitchell Zone of the Lutheran Women's Missionary League held their annual Spring Christian Life Workshop at St. Paul's Lutheran Church, Plankinton, April 6. Crews from nine electric cooperatives, as well crews from at least three contractor construction companies, have been assisting with repairs at cooperatives hardest-hit by Winter Storm Wesley. South Dakota State University Extension Community Vitality is seeking South Dakotans who see opportunities to lead systems change in their organizations and communities to apply for the South Dakota Change Network. The South Dakota Department of Transportation said work was scheduled to begin a project on Highway 18 near Tripp, April 15. There's no doubt the storms this spring have been difficult for many of our communities. In March, a bomb cyclone left part of our state underwater and part of our state in dangerous blizzard conditions. A "Night of Rustic Romance"
Although the April 11 blizzard kept students home from school for two days and had many wondering if the Tripp-Delmont prom could be held, the event took place without a hitch. Springtime in South Dakota can be trying, as a late storm made life challenging last week. The Tripp-Delmont School held an assembly March 29 in the gym, acknowledging and awarding eight students who received honors for their Veteran's Day essays.